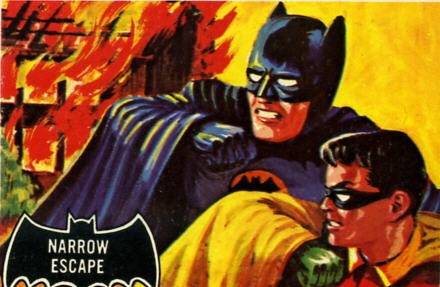 Once the Batman TV Show began, so did Batmania. 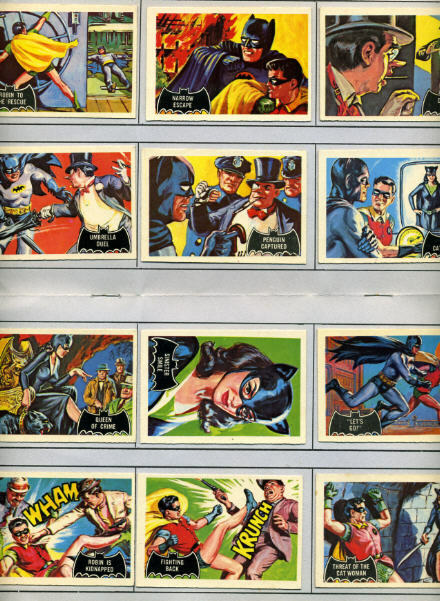 A number of sets of Bubble Gum Cards appeared in 1966 and 1967. I collected them all and even sent off for the Albums to stick them in. Later Albums came with little pre-cut slots to lodge the cards in place which was far more sensible. The first two series of cards were painted, probably by the same guy(s) who had painted the Civil War and Mars Attacks cards of a few years earlier. 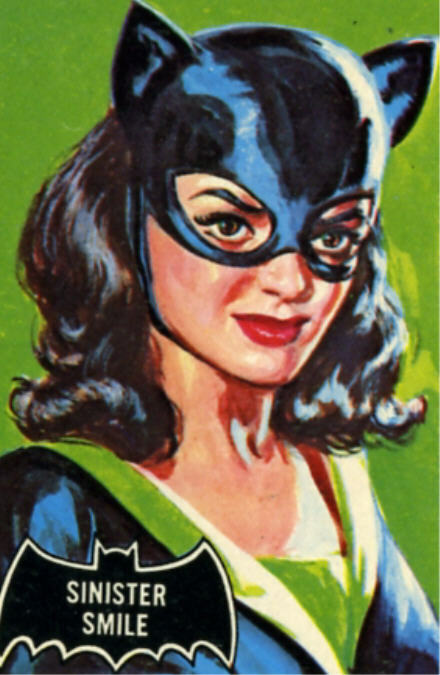 I like this Catwoman card. At about the same time as the cards a number of Colouring Books appeared. Somehow this one is still on my bookcase to this day. 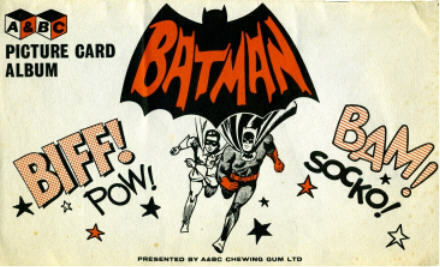 I think there were three illustrated sets of batman gum cards in the 1960s: the first (1966) carried the title of the cards within a black bat shape; the second within a red bat shape; the third within a blue/cyan bat. 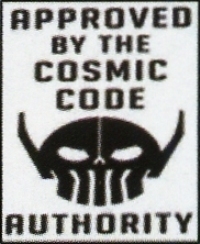 The first series told a complete story over 55 cards. The second and third series contained 44 cards, each card telling a brief, discrete story. The second and third sets also had picture puzzle backs of various heroes and villains from the Batman universe. Originally produced by Topps in the US, they were distributed by A&BC in the UK. 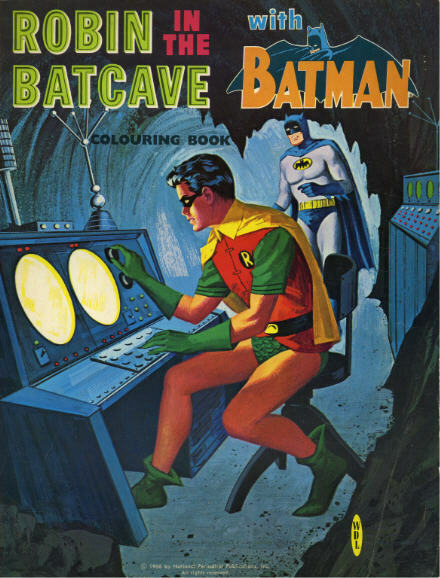 Topps issued reprints of all three series as a boxed set in 1989. Happily they’re often offered for sale on eBay. They were (in the main) illustrated by Norman Saunders, who, as you suggest, painted the US Civil War, Mars Attacks and the controversial (scenes of torture and violence!) Second World War gum card collections. Thanks for the info. Bubblegum cards are a subject I keep meaning to investigate further. I’m sure there must be books on the subject now. I wasn’t aware the Batman cards had been re-issued in 1989. I just collected all three sets at the original time of release. I’ve just had a quick rummage through a few boxes and was amazed at the variety of long-forgotten stuff in there. 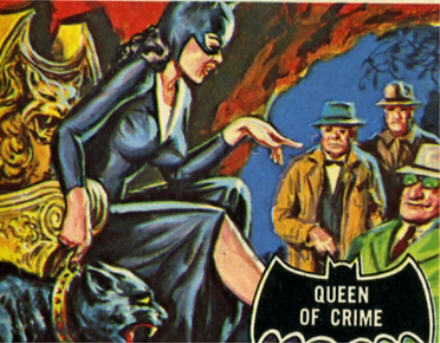 Along with the usual Brooke Bond cards and pre-war cigarette cards passed on from my grandfather there are some Batman cards that are photos rather than painted. A full set of Thunderbirds cards that are black and white photos, Tarzan, Beatles, Monkees, Flags of the World, Civil War, endless Football cards and loads of “sweet cigarette” cards from the 1960s. (I think they call them “candy sticks” now.) These look very interesting covering many subjects including Thunderbirds and Superman! I feel another blog may be in order! I have a box of topps batman new second series cards. they are in a yellow box with batman and the joker on it. It has 15 UNOPENED packs still inside. Can anyone tell me how to go about getting a value on them? i was going to put them in a yard sale when my friend told me that i might want to see how much they are worth. Thank you. Actually, although many cards are still out there not too many of the original 1960s wrappers and outer-cartons have survived so you probably have a nice collectable there. If they are the re-issues they’re still collectable but not so rare. I’d put them on the shelf next to my Aurora model Batman.Maybe you could put them on eBay with a decent reserve price and see what happens. Good luck. how much are these cards worth? Last week they were trading on the stock market at $1000 each. However since the credit crunch the bottom has fallen out of the Batman card market and they are now selling for less than $1 each and falling. Next week you will probably have to pay someone to take them away…. As you can see, although I’ve only mentioned Gum Cards in passing I soon realised how many people hold such great affection for them. I know there are modern “trading cards” to collect but my nostalgia stems from the fact that when I was buying Civil War or Flags of the World cards in the 1960s I was using all the money I had in the world (ie: what was in my pocket).To actually complete a full set of anything was a great acheivement !! I’ll certainly visit your site. I unearthed some more Brooke Bond tea card albums only the other day. And an album of Walls Ice Cream cards. Do you remember them ?? I got them of a relative but I’m not sure what series. There are 55 cards in all but there are a few missing. You think I could buy them over the net? No Sir as far as I’m aware no one has ever bought anything “over the net”. Wait… you’ve just given me an idea. What if I started to sell books and CDs that way. I wouldn’t need shops. I could just set up a giant warehouse somewhere like Milton Keynes and send out the stuff through the post. I could name the company after a river…The Thames, Mississippi or Amazon. Fantastic!! Or better still, I could start an on-line Auction site. That way I wouldn’t even need books or CDs or a warehouse. Just a few dozen Servers !! I’d soon have millions of customers and be rich !! Or what about starting a site where people just type in a word and you get a long list of all the sites containing that word. I could call it “Giggle” or something. We’re gonna be rich ha ha ha ha ha ha ha ha …………………………………………..